Producer Steve Margetis and Ethos Performing Arts proudly present the New York Premiere of The Family Room, a dramedy written by Emmy Award nominee Aron Eli Coleite and directed by Gwenyth Reitz. The Family Room runs through October 23, 2011 in a limited engagement at the ArcLight Theater, located at 152 West 71st Street between Broadway & Columbus Avenue in New York City. 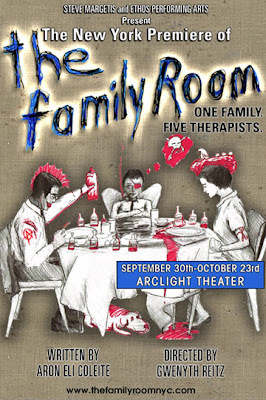 For more information on the play visit http://www.TheFamilyRoomNYC.com. All fifteen-year-old David wants is to be a typical teenager, angry with everyone, especially his parents - two therapists who treat David like just another patient. But in this world even therapists have therapists, and with David’s rage mounting, and his parents’ marriage on the rocks, every member of the family finds themselves in treatment, and no one is getting any better. When David secretly tapes his father’s sessions with a troubled girl from David’s school and uses his knowledge to begin a budding romance – lives collide, therapists become patients, parents act like children and two teenagers must decide whether big problems can be solved by friendship alone. Heartbreaking, hilarious and perceptive, The Family Room, takes an incisive swipe at the dizzying revolving door of therapists in therapy, and the moments of true intimacy that stop us cold. Aron Eli Coleite is an author of multiple works for the stage, screen and comic books. His background in theatre includes work as the Literary Manager, Dramaturg and ultimately, Artistic Director of Santa Monica’s Powerhouse Theatre Company. Coleite currently serves as a co-executive producer and writer on the new Oren Peli/Steven Spielberg TV series, The River, premiering on ABC in 2012. His prior television credits include Party of Five and the NBC crime drama Crossing Jordan. Most recently, he served as a writer/producer on the hit NBC series Heroes. For his work on Heroes, Coleite was nominated for an Emmy Award and won a People’s Choice, TV Land and Saturn Award. He is currently writing a pilot for a new CBS series to be produced by Jerry Bruckheimer, a project for the Syfy Network with acclaimed television and theatre producer Bill Haber, and a feature film for 20th Century Fox. Coleite is known to comic book fans around the world for his work on Marvel’s Ultimate X-Men and creating the series Vice and The Covenant for Top Cow Comics. Gwenyth Reitz’ directing credits include a production of Macbeth for young audiences with Lincoln Center Theater, the new jalopy, a site-specific dance/theater work produced by Dance New Amsterdam as part of their Leading Ladies Series, Spare Change at the Soho Playhouse and Class Behavior with the Vital Theatre Company. Gwenyth has served for six years on the Theater Commissions panel with the New York State Council on the Arts and is an alumnus of the Lincoln Center Theater Directors Lab. The New York cast includes David M. Pincus (A Midsummer Night’s Dream with Theater for a New Audience at Lincoln Center, Joey’s Jive at MCC, Medea with Target Margin at St. Marks Ontological), Nancy Stone (Co-star on HBO’s Big Love, Embedded with The Actor’s Gang, Improv with Bay Area Theatersports), Jacqueline Sydney (The Kitchen Table - NYIT Award nominee Best Supporting Actress, Dear Harvey - 2010 FringeNYC Best Ensemble Acting Award), Jonathan Tindle (Bed Among The Lentils and Mrs. Warren’s Profession - Helen Hayes Award nominee, Full Moon Fables - SAG Peer Award for Best Actor, The Madness - NYIT Award nominee), Coco Medvitz (Collected Stories at Pennsylvania Center Stage, Richard III and As You Like It at Shakespeare Santa Cruz) and in their New York stage debut, Leah Barker and Tyler Lea. The creative and production team consists of Jian Jung (Set Design), Jeanette Yew (Lighting Design), Amanda Seymour (Costume Design), Culley Johnson (Sound Design), Matthew Williamson (Assistant Director) and Shelby Taylor Love (Production Stage Manager). Ethos Performing Arts, lead by Artistic Director Christos Alexandrou, is a not-for-profit organization based in New York City, promoting arts and culture. Ethos supports new writers and new projects by producing staged readings, organizing theatrical productions and musical concerts, and overseeing projects. For more information on the company visit http://www.EthosPerformingArts.org. Performances are Thursdays – Saturdays at 8pm and Sundays at 2pm with an additional performance on Wednesday, October 19 at 8pm. Tickets are $18 and can be purchased online at http://www.BrownPaperTickets.com or by calling 1-800-838-3006. Train access via the #1, 2, 3, B or C to 72nd Street.